Thanks for Emmanuel Abam which has been reminded especiallly about the Samsung Galaxy Y Pro Duos manual (GT-B5512). On this blog, we've discussed about specs for the smartphone. You can read here. I think there is two important Issues of this manual that is about settings guide and troubleshooting or problem solving. 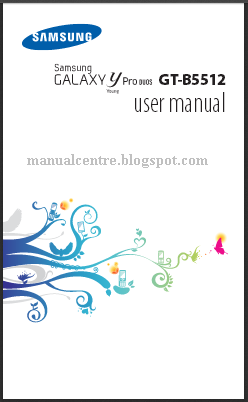 The Samsung Galaxy Y Pro Duos GT-B5512 user manual available in english language and consist of 144 pages. It's devided into 12 section (include index) and contains reference information such as tutorial Install the SIM or USIM card and battery, Insert a memory card, Use the touch screen, Lock or unlock the touch screen and keys, customise device, Download applications from Android Market, using messages, Google mail, using camera, FM Radio, using contacts, using web for access the internet, using maps and latitude, using samsung apps, using bluetooth and wi-fi, Mobile network sharing, GPS, VPN settings, using Polaris Office and task manager. Then about settings guide like call settings, Location and security, sound and display settings, Wireless and networks settings, backup, restore phone, Factory data reset, Portable Wi-Fi hotspot settings also troubleshooting problem. In Idle mode, open the application list and select Settings→Privacy→Factory data reset→Reset phone→Erase everything. In Idle mode, open the application list and select Settings→Wireless and networks→VPN settings →Add VPN. In Idle mode, open the application list and select Settings→Wireless and networks→VPN settings. Select a private network to connect. In Idle mode, open the application list and select Settings→Wireless and networks →Wi-Fi settings. Select a network indicated by the WPS icon and select WPS PIN. On the access point, enter the PIN and press the start button.